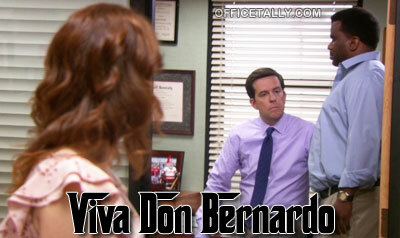 Here are photos from The Office Season 9 episode, Andy’s Ancestry. Here are deleted scenes from The Office episode, Roy’s Wedding. Erin hopes to trade one desk for another. The staff reveals some of their favorite causes. Roy and Lara’s wedding inspires some guests to tell it like it is. Here are photos from The Office Season 9 episode, Roy’s Wedding. Summary (NBC): Pam and Jim go to Roy’s wedding — David Denman guest stars. The wedding toast of Pam’s ex-fiance Roy causes Pam and Jim to examine their relationship for buried secrets. Dwight stubbornly protests Nellie’s mandatory charity initiative by supporting the Taliban and agreeing to live by their severe laws. Clark hits on Erin by dangling a fake newscaster job; Andy also takes the bait. Here’s a promo of The Office episode, Roy’s Wedding, airing September 27, 2012. Here’s a trailer of Mindy Kaling’s new comedy, ‘The Mindy Project,’ with guest star Ed Helms! The Mindy Project premieres tonight on FOX.